Cities are given an inequality score on each category, then the scores are averaged for each to come up with a final score, which is then ranked. This is a vast improvement on last year, where they were ranked within each category, then their ranks were averaged, as the variations within categories change quite drastically. This was one of my biggest issues with last year's report. Within each category, sub-indicators are weighted according to their variance. This was used in other similar studies before, and is helpful at revealing actual differences between cities. No weird ranking arithmetic errors in the appendices! Some news sources seem to be suggesting that Victoria has 'risen' in the rankings this year. Nope - this is essentially a completely different yet topically similar study, with a different sample size, new measures, and different methodologies. Consider this a re-do of the previous study, especially since almost all of the data ranges from 2007 to 2013. Inequality ratios aren't capped. This is definitely a judgement call, and isn't wrong necessarily, but when the World Economic Forum did a similar study they capped ratios at 1.0 (perfect equality) so that doing better than equal in one area (for example, education) can't be used to offset poor scores in other areas. This actually would result in a change in the rankings of 20/25 cities. 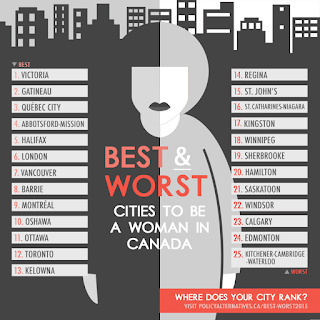 Inequality vs "Worst Place to be a Woman." The report explicitly doesn't compare quality of life standards between cities (apart from one - see next point). Again, the authors say, "The report focuses primarily on the gap between men and women, rather than their overall levels of well-being," yet their title doesn't mention inequality at all, and instead sounds like a judgement explicitly of well-being. I personally think this is clouding some of the discussion surrounding the report, since it seems to prime people to be angry before even reading it. It's ridiculous to say Edmonton and Calgary are the worst places for women in Canada, but also say that they have the lowest levels of women in poverty and highest levels of highly-educated women. One measure that's new this year is the percentage of women per city who've had a pap smear test in the last three years. Interesting measure to include, definitely has potential to be a decent indicator of health in women, but has almost nothing to do with comparative inequality between men and women. The health category has ratios of perceived stress and happiness between the sexes, life expectancy ratios, and a percentage of pap test-takers, and lumps them all together into a number that's supposed to represent the equality ratio. It doesn't belong in this sort of an analysis. This is a list of cities with Clipart in the background. It is not an infographic. Stop saying you made a fancy infographic. I guess I ended up with more negative bullet points than positive, but in reality they're mostly me being nit-picky. This study is a much better version of what was published last year, and (happily enough) tends to agree quite closely with what I did a few months ago. If the alarmist language in the title is what it takes to get gender inequality discussed openly, then that's fair enough, but I would personally be happier if this was approached a little bit more academically with a little less sensationalism. Either way, Edmonton has plenty to work on, and in the future I hope to see our score go up. Just, like, wait a couple of years, otherwise you'll be using the same data for next year's "updated" report again. You must know Canada education system before proceeding. Most publicly funded schools are non-religious but there are exceptions in the provinces of Ontario and some cities in Saskatchewan. The vast majority of privately funded schools in Canada are religious-based.